Rudimentary analytics can be valuable to understand what your customers and prospects do. 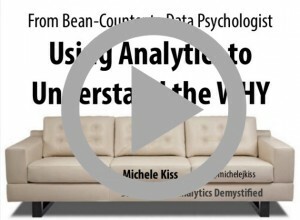 However, the true value from analytics comes from marrying that with the why – and more importantly, understanding how to overcome the why not. At Analytics that Excite in Cincinnati this month, I spoke about qualitative methods that analysts can use to better understand people’s behavior and motivations. Check out the presentation on SlideShare.